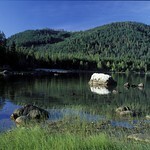 Lake Wenatchee residents sought the Land Trust’s help to protect Nason Ridge from the proposed harvest. CDLT helped to mediate a compromise between Longview Fibre and the Friends of Lake Wenatchee Forests. As a result, Longview substantially modified their harvest plans to address the local concerns. This was a tremendous learning experience for all sides. Longview’s positive, responsible approach to addressing citizen concerns was an outstanding example of how a conflict can become a win-win situation if both sides are willing to listen, learn, and find common ground.